You are no dummy if you want to reduce your risk of disease with the simple and effective changes characteristic of an anti-inflammatory diet and lifestyle. Inflammation is the hidden factor in the pathology of disease, such as heart disease, diabetes, and cancer, and is not addressed nor tested by most physicians. 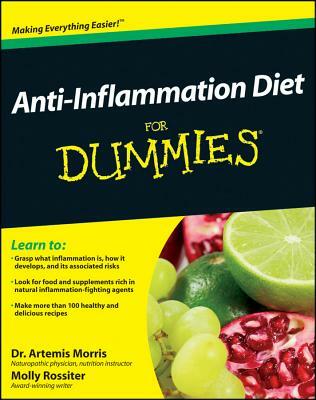 Dr. Artemis Morris, Naturopathic physician, nutrition professor, and licensed acupuncturist, recently authored a book for the popular “for dummies” series called The Anti-inflammation Diet for Dummies with the award-winning writer, Molly Rossiter. The information in the book is useful for anyone who wants to reduce their risk of chronic disease or relieve themselves of the problems that are mediated by inflammation, which includes symptoms ranging from fatigue to signs of chronic disease. Recent research has also confirmed that the real threat of high cholesterol levels is not due to total and LDL cholesterol numbers alone, but rather due to the process of inflammation initiated by the oxidation of LDL cholesterol in the blood vessels. By reducing inflammation our risk of cardiovascular and heart disease decreases regardless of our cholesterol numbers. In a normal response, inflammation is the way our immune system responds to an infection, injury, or irritation and is needed to help our body heal from short-term assaults. For example, when you cut yourself, inflammation, characterized by redness, swelling, and pain is caused by the immune system mobilizing it’s immune system defenders, the white blood cells and a nonspecific immune response, to help heal the cut. The problem with inflammation is when it goes on for a long period of time or when the immune system has gone awry, as with autoimmune diseases. There are many sources of inflammation, including, a poor diet, food allergies and sensitivities, stress, environmental allergies and toxins, and pathogens (bacteria, viruses, spirochetes, etc). How do we keep inflammation under control and thus decrease our risk of disease? The basic points of an anti-inflammatory diet are similar to the Mediterranean Diet and the Okinawa Diet of Japan, which were found to not only decrease the risk of chronic disease, but also increase longevity. The additional elements in an anti-inflammatory diet are addressing food allergies and sensitivities and reducing toxins and pathogens that can cause immune system imbalances. Individualizing a diet and identifying food allergies and sensitivities with the help of your Naturopathic physician will allow you to eat the way that is optimal for your body and minimize the risk of developing disease. Research has shown that the factors responsible for decreasing inflammation include omega 3 fatty acids and antioxidants, which are found in high amounts in certain foods. The omega 3 fatty acids shift the biochemical synthesis of the cells to produce anti-inflammatory chemicals that reduce the risk of heart and cardiovascular disease, prevent depression, improve memory, and are associated with longevity. Antioxidants, such as the pro-anthocyanidins found in blueberries, work by decreasing free radical damage to the cells of our body. Free radical damage happens when our immune system is activated by pathogens, allergens, and toxins. Antioxidants have also been shown to help prevent disease and are associated with longevity. Yogurt is included in the diet because it contains live cultures (probiotics) that balances the immune system which is found primarily in the gastrointestinal system, called the Gut-Associated Lymphoid Tissue (GALT). Probiotics, such as those found in some yogurts, keeps our immune system and gastrointestinal system healthy and prevents bacteria, viruses, yeast, and allergies from making us sick. Foods high in omega 3 fatty acids: Salmon, halibut, sardines, mackeral, walnuts, flax seeds, leafy green vegetables. Vegetarian sources of protein that are high in fiber, nutrients, and monounsaturated fatty acids: Beans, nuts, seeds. Vegetables and fruit due to their high antioxidant content. Whole grains that are gluten-free: Quinoa, brown rice, oats, millet, etc. Lean proteins in moderation: Pastured, free-range, grass-fed eggs, poultry, and some meats. Anti-inflammatory oils: Virgin olive oil. Other oils to use in moderation: coconut oil, sesame oil, grape seed oil. Plain yogurt with live cultures if you are not dairy sensitive. Refined sugars and carbohydrates, such as, white sugar and white bread and foods that turn into sugar quickly in the body. Processed foods that contain artificial ingredients, colors, or pesticides. High fructose corn syrup and foods that contain glucose or artificial sweeteners (aspartame, Splenda, etc.). Pro-inflammatory fats: Hydrogenated (trans) fats and saturated fats found in red meat. Non-organic vegetables and fruits that are high in pesticides (see the dirty dozen from EWG). Food allergies and sensitivities. The most common ones are to gluten, dairy, and corn. The methods with which you cook your food is as important as the types of foods you eat (or don’t eat). Frying, barbecuing, grilling, and microwaving increases inflammation by creating Advanced Glycation End-products (AGE) in the food via a chemical reaction, called the Browning reaction or Maillard Reaction, that occurs in high heat between the proteins and sugars. Better methods of cooking your food to decrease inflammation include boiling, steaming, baking on low heat, or stir-frying. Also, including raw food in your diet will add nutrients and enzymes to your diet. Some simple ways of including raw food in your diet is to eat a salad daily or juice fresh fruits and vegetables on a regular basis. When diet alone is not enough to reduce inflammation because you have a chronic disease or autoimmune condition, nutritional supplements are helpful in reducing your body’s burden of inflammation. Some supplements that reduce inflammation include high potency fish oils, turmeric (curcumin), bromelain, and Vitamin D. Your Naturopathic physician will recommend an individualized treatment plan that includes supplements to reduce inflammation that are specific for your needs and do not interact with any medication or other supplements. The book contains more details on the diet and hundreds of recipes to make the anti-inflammatory diet more of a new way of eating rather than a temporary diet. The book is available at Amazon.com, other online book sellers, and at your local bookstore.